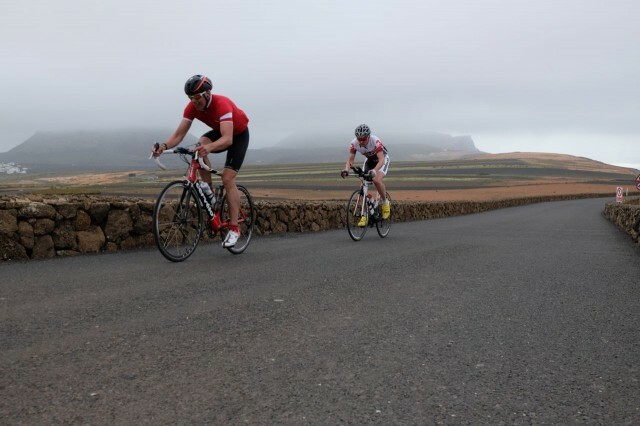 Thursday was the second full trip around the Lanzarote Ironman course this year for Mark and me. This time Mark was supporting in the car – actually minibus as the hire company handily upgraded us – and I was on the bike (for a while). There’d been a lot of anticipation the night before, this group had plans to target a 200km ride and they weren’t going to do it slowly. My own plans didn’t extend beyond La Santa, especially after a night of cold and hot sweats had left me feeling drained. At least the island was being kind to us and the strong winds of the last couple of weeks were finally dying away. So while a few got out early and our slower group headed in their own direction I joined the fast group, firmly at the back. They like to set a strong pace from the start and we were soon out of Costa Teguise heading up towards the rough Nazaret road. When we turned left to climb the hill to the Campasino I couldn’t resist moving to the front and pushing the pace up. In past visits there’ve been many, often short lived, races to the Campasino at the end of an Ironman loop. I carried on at the front down the middle of the island until Steve cruised through on his aerobars and lifted the pace further. That’s when I started to suffer. From my perspective all was fine till shortly after our first water stop at Puerto Calero. Firstly I started in the wrong gear, got dropped and had to work back on; then once I was back on the pace picked up and by the top my legs were feeling decidedly unhappy. Having told Mark I’d ride to La Santa and see how I felt, I was already questioning that plan. For the next few kilometres down to El Golfo I was yo-yoing off the back and then spat out fully. So, resigned to the fact I didn’t have the legs for this group, I rode round El Golfo at my own pace; Gary kindly accompanied me until he realised he couldn’t tow me any faster. At Yaiza we had a coffee stop with the minibus to hand. I got off my bike, put it in the back and changed out of my kit. I was too slow to go with the group to La Santa and didn’t relish the suffering involved. The positive though? I’d got to see how strong some of my athletes have become (for the first 60K); I’d watch the rest from the comfort of the van and let them work without feeling they had to hold up for their coach. Not that I’m sure they would. We also caught the early starters at Yaiza. Well, all but one, it was soon realised that Steve Lambert was missing, and that he’d probably taken a wrong turn heading back towards El Golfo. Mark drove off to find him and he returned under his own power a few minutes later. Not the first mishap or misdirection for Steve this week. From the comfort of the bus you have a different view of the day. Mark and I sped past the bunch on Fire Mountain to get to the next short stop at La Santa ahead of the group. 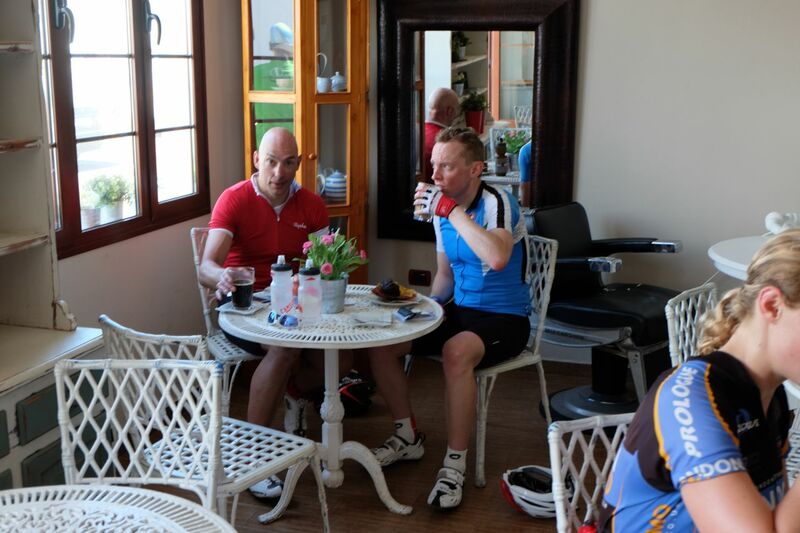 Then on to Jonnie Bakes in Teguise for a proper stop before they tackled the final portion of the island. The fast group came through quickly and were gone before the next bunch arrived for a quicker turn around. Finally our slower riders arrived and, having done a much bigger loop than planned, hopped in the back of the bus. The gap between fastest and slowest had opened up and it was only by virtue of some wrong turns that we beat the fastest riders to the top of Mirador del Rio. Overcast and windy at the north end of the island we got them moving quickly to hit their 200km target for the day with a detour down to Orzola. Then we had a longer wait until the remaining riders arrived. One more athlete joined us in the minibus, done for the day; the final two pushed on also aiming for the 200K marker. Other than a brief stop at the Arrieta petrol station that was the support job done, we headed straight back to the hotel to unload the bus. We beat the athletes back, but they rolled in over the next hour all having hit their targets. The long day was done. After dinner it was – I’m told, I didn’t stay this time – another late night at the bar for some. Interesting preparation for the time trial up Tabayesco on the final day of camp.